This craft can be fun to help children with a first child care, preschool, kindergarten and first-grade experience and to discuss safety issues associated with driving a school bus, a van or any type of motorized vehicle. For children age 3 and under print template B&W 2 (bus) to yellow paper and they can color the elements in template 2. Children can glue elements directly to the bus template without cutting out the bus. For children age 4+ print templates in color or B&W and encourage scissor cutting skills. The wheels can be attached with two fasteners which allows them to move around. Identify colors and any shapes on the templates. Some children like to discuss the colors as they choose them while coloring or painting the templates. Optional: practice numerals and count the pieces. Write numerals in the back of the template elements in the order of assembly and turn face down. The bus can be #1, windows numbered from left to right 2, 3, 4, 5, door #6 and wheels #7 and #8. 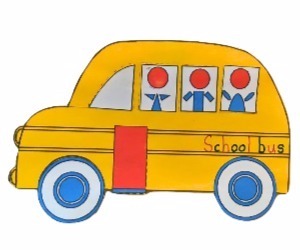 Resources: School Bus Lesson Plan: Visit the companion lesson plan for this craft, it includes: safety resources, song and other activities.